Filac FasTemp Thermometer & Probe Covers: Filac's Advanced Sensing Technology (FAST) allows thermometer to target a precise temperature by searching for trends that are unique to a patient's individual body size. Unlike other quick predictive thermometers that are programmed to display temperature within a specified time frame, FasTemp will not produce a reading until it complies with both ASTM and CEN standards. Yet results only take about 4 seconds for oral readings and 10 seconds for auxiliary and rectal measurements. Includes 30-second pulse timer and color-coded isolation chambers to reduce the risk of cross-contamination, wall-mountable base and mounting hardware. 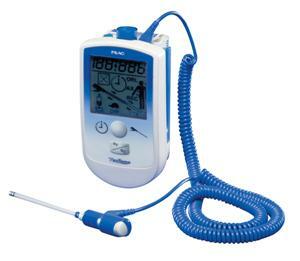 Filac FasTemp Thermometer with Oral probe.